Hey guys welcome back, it’s Rowena, it’s Felicia, and we’re getting to that time of year when winters rolling around or blowing around, and we’re all collectively wrapping ourselves in our blankets burrito style from our bed until we go out the door because we just want to protect ourselves from the arctic winds, our skincare also needs a little bit of a switcheroo from hot humid climates to winter, and it needs way more protection and if you guys have seen our moisturizer video, you’ll know what happens is transepidermal water loss, which is basically where the moisture in our skin starts to evaporate and flutter away into the atmosphere during the winter and colder months, so we have to restore that moisture back in with the skincare products that we use, so today we’ve teamed up with Ulta to share with you beauties our winter skincare routine to cure us of the winter blues, and our winter skincare concerns because we all have a lot of those, so Ulta is having a huge event called the love your skin event, and they’re gonna feature a bunch of amazing epic steals of deals, so how it works is every day from January 6 to 26, you get a lot of these products for 50% off, and then you can also get things under $10 people, like the Mario Badescu, so pretty sweet deal if you ask me, and without further ado, let’s get started on the essentials of our skincare products to fight that dry flaky mess that is our skin, yeah because let’s be real, the only thing that should be flaky is a croissant, now let’s get into the video, starting with cleansers, remember what we said in our how to properly cleanse your face video where if you don’t properly cleanse your face of the day’s nasties oils grimes, no matter what product you apply afterwards, it’s not gonna properly do what it’s supposed to do, so no matter what time of the year it is, cleansing is a very important, so the reason why our skin is more particularly dry scaly and fish like in the winter months is because the humidity levels in the air actually drop, and then you’re also fighting things like the cold harsh winter as outside as well as heaters, and so everything is just like pulling moisture out of your skin, with cleanses you want to find ones that aren’t too stripping of the natural oils on your skin which is the barrier that protects you from like environmental factors, so the best cleansers to use if you are a feeling a little too stiff and dry are gentle non foaming cleansers, creamy ones cream milky, yeah those are great, and also make sure when you’re washing your face, try your best to use lukewarm water, because I know it’s cold you want to use water that’s like so warm, and then warm up your face, but then the warm and the hot water actually strip natural oils, so make it even more drying, and because it’s winter you want to stay away from traditional soap ingredients like sodium lauryl sulfate, or even things like overusing AHAs and like BHAs, but that’s not to say you shouldn’t use it, because chemical exfoliation is a really good just like lower the amount of times you do it per week, or just don’t overdo it in general, so here are some of our suggestions that we’ve been loving for the winter months, the first one is the Confidence in a cleanser by IT cosmetics so this one has been like a game-changer for you recently right, yes and she was so exciting for me to try, she’s like you need to try you need to try, I’m like okay why don’t you try it yourself, no because when I was looking it up, it’s developed by dermatologists, plastic surgeons, oh plastic surgeons I was like ok, so they know a little thing about aesthetic, and it also took them eight years to perfect and research like what goes into the ingredients, and how it’s used, I can feel the history of the eight years, the blood sweat and tears that went into the eight years, because I’ve never used a cleanser like this before, so it says it’s a skin transforming hydrating cleansing serum, and the cool thing or what sets this apart is they say you can wash your face and after washing it, you don’t need to moisturize, because it is so moisturizing, I feel that but I feel like I still need moisturizing, you still probably want to do that, when you emulsify it turns into this very creamy texture that’s buttery velvety without being thick and heavy, so many adjectives, does that froth, minimally, ok if you guys already have dry skin like me, it’s imperative to double down on hydrating and moisturizing ingredients for the winter, it has hyaluronic acid which is super hydrating, soothing oatmeal anti-aging hydrolyzed collagen and ceramides, and in terms of ingredients, it’s got all the good stuff like tea tree leaf oil turmeric root extract camellia leaf extract grapefruit and lavender oil, is this not awesome or is this not awesome, so this is usually $24 but for love your skin event, it’s gonna drop down to $14, experience what velvety butter feels like on your face, so the one that I’ve been using if you have like oilier skin so she has dry which is why it’s more like rich and stuff, I’ve been using the Boscia charcoal cleanser, it has activated charcoal powder to draw out all the impurities and dirt and excess oils, but this charcoal cleanser also warms up with a slight heated feeling, as it makes contact with the skin, so it kind of like helps to open up the pores, so it’s able to get out the dirt and oil and other impurities that cause acne, but also vitamin C and glycolic acid to help with refining the skin’s texture, I’ve also used this with their Boscia puff , there’s like black puff thing, it is a very soft physical exfoliator instead of using a face towel, I always like charcoal, charcoal is one of those all-star ingredients for people with oily acne skin because it helps like a magnet, I just feel like it, honorable mentions include First Aid Beauty Face Cleanser, ummm this one’s really good, I use this in the winter when I first moved here three years ago, and it’s just one of those My skin is not used to this, what is happening. Help me, help you. I feel like first aid beauty is really good for sensitive skin, the whole line is designed for sensitive skin. and it’s like uber hydrating the whole line, as well as the derma e nourishing rose cleansing oil, and the Dermalogica precleanse, okay cleansing done now what’s the next step toner, as we’ve mentioned in our toner video, I mean we’ve made a video on every single step, so it’s pretty helpful if you need a little extra information on each of these, but basically toners are there to add moisture back into the skin, and it’s also there to help balance your pH levels, because some cleanses as we said before if it’s too stripping, it’ll actually move your skin’s pH level to a more acidic level, and then when you start toning and moisturizing, it brings it back to a neutral state, which is where your serums and moisturizers actually work, and toners also help remove any extra nasties and makeup grime that you forgot, the mist, yeah especially the neck, I always find when I wipe here, I’m like how is makeup still here, mine’s always around the parameter, so toners are pretty straightforward, they just add an extra layer of hydration to a ready thirsty skin, and another reason why they’re great is because if you when you do apply toners and your skin is damp, it allows these products absorb a lot better into your skin, because damp skin is far more permeable than dry skin, like a sponge, like a dry sponge, think about like what you wanted to help it with, the active ingredients will like determine which one you pick, alright so for toners, we have some really great options for you, because they’re both under $15, so the one that I’ve been using is the Mario Badescu glycolic acid toner, so with toners I find I kind of jump in and skip around different ones depending on how my skin is feeling, and what it does is help shed the dead skin that’s on the very surface of your skin, and helps reveal the younger fresher ones, and glycolic acid is pretty safe to use, especially for those of you who are just getting into AHAs, so this toner has 2% glycolic acid and grapefruit extract, which helps with dull and congested skin, and it also helps with reducing hyperpigmentation, which might come from any acne scarring or things like that, teacher Fel I have a question, What, what if your cleanser has AHA already and your toner has AHA, and then serums, is that okay or, actually it’s so okay, it depends on the concentration, but it also depends on how your skin reacts to it, so your cleanser is fine if it has a AHA or BHA, because you wash it off, so that’s step one and it helps to get down into the pores, toner and serum is also fine to have like AHA, because it includes so many different types of acids right, it’s usually a blend of AHAs, and some are a little bit more stronger than others, so if I have like a strong AHA then I won’t use every single step with it, but I mean it’s fine to use it, because it’s basically in every single step anyway, okay thank you, so this is normally 18 but on January 25th, you can get this for nine dollars, if you guys have been wanting to try Mario Badescu, this is a great toner, and for me I’ve been trying this big boy, so huge just for size reference, if you use that every day for like a decade, yeah so this is Clinique’s clarifying lotion, which is a twice a day exfoliator, so there’s witch hazel with salicylic acid, and sodium hyaluronic, so it is like a bougie version of Thayers, if you guys like Thayers, yeah it’s also alcohol-free, and it’s also a huge bottle, but what I find interesting is that the witch hazel is one of the top five ingredients, so there’s like a lot of that, it’s water and then witch hazel, and then the BHA which is the salicylic acid, must only be a little bit, it doesn’t say how much, because if you can use it twice, it should be quite gentle, yeah it works like how a good toner should work, it feels clean and then it makes you feel your skin your face feel very refreshed, so this is $25, but on January 26 it will be $12.75, I didn’t realize how affordable toners could be, they’re much cheaper than serums, yeah it’s mostly water, yeah it is mostly water, it’s cool yeah, all right serums to recap what they are is basically a dose of highly concentrated active ingredients that are designed for specific skin care concerns like lightening hyperpigmentation acne hydrating that typically found in little bottles, because it is so powerful, it’s like a very very powerful punch, yeah and since there’s so many different types of serums out there to target different very very different skin care needs, we’re just gonna jump into our favorites and the ones that we’ve been using, so for me I have very dry skin, and in the winter time if I want to hydrate, I’ll use the body shop drops of youth concentrate, I’ve been going through bottles of this, because every time you bring in serums, it was like empty and now it’s like replenished, new bottle, and I actually learned something so when I first started using this, I will put four drops on my face and then smooth it out, but then I realized after doing research that a little goes a long way, so now I’m like okay too much, this concentrate is infused with three plant stem cells, and leave skin feeling instantly smoother and replenished with moisture, it’s quick absorbing and non sticky, and it helps with tightening pores makes the skin feels bouncier and the lines appear smoother, so drops of youth to me is just a very reliable friend who does what it’s supposed to, it doesn’t really go above and beyond, and that’s not a bad thing, but it’s like something that I can always come back to that I know will help my skin come back alive if it was struggling, it’s just like one of those serums that it’s like a no-brainer, and when you don’t need anything in particular, but you just need a serum, it’s very hydrating and moisturizing though, it reminds me of the Innisfree green tea extract, mmm it’s a little similar, and if I want to lighten or brighten my skin, I actually like using the wintertime, I know you cannot relate, but I like using wintertime to lighten and brighten my skin, because summertime it’s like you’re so exposed to the sun, and then wintertime the sun is not out as much, and you tend to spend zero time outside, so I’ll use products like the Murad rapid age spot & pigment lightening serum to help my freckles just you know, subside yeah go in the cave for a bit, hide for a little bit, this has 2% hydroquinone which is a pigment lightening ingredient that doctors actually prescribe most, but this Murad serum formulates it at the highest level available without prescription, it will help lighten dark spots sun spots and age spots and even an even skin coloring like hyperpigmentation, there’s also glycolic acid to lift away dead cells that cause dull looking skin, so this is usually $72, but on January 12 you can get the Murad serum for $36, what a deal, so I actually really like Murad products because they have different lines as well, and I tried the blue one, so like this orange one is for brightening lightening, but they also have the blue one which is for like acne problematic skin, and it like really worked when I was breaking out but anyway just thought I’d mention that, so the one I’ve been using is the Bare Minerals skin longevity vital power infusion, so this one I feel like is a little bit more lightweight, watery compared to more gel consistencies, like the one that you have just mentioned both of them, the ingredients niacinamide which is like an all-star ingredient for any skin type, it brightens it hydrates it’s nourishing, yeah so my skin is very sensitive, and so after incorporating this into it while I was trying it out, it didn’t break out or didn’t get inflamed, so one that’s like the best sign ever, because my skin will immediately react, and you use it day and night, and it’s also got that all-star ingredient is this patented long-life herb extract, this one is normally $38 and it’s 19 on January 13, So yeah those are the 2 serums, hopefully by now you have a pen and paper out to mark down these numbers on your calendar, Seriously it’s like 50% off, honorable mentions four serums include First Aid Beauty Ultra Repair Hydrating Serum and the Vichy Mineral 89 Face Serum with hyaluronic acid. 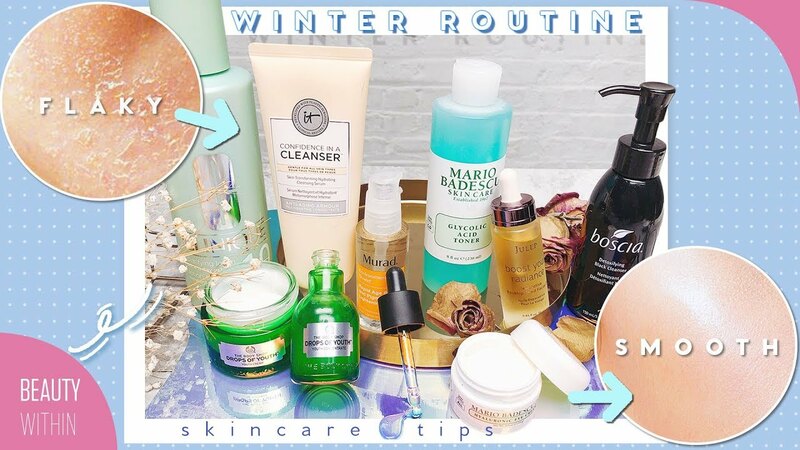 Now moving on to moisturizers, which is probably the most important step for your winter skincare routine, because it does everything from deliver moisture and hydration into your skin, it also locks it into the skin as an occlusive and it also softens the skin, so it’s like basically you really need moisturizers in the winter, some tips for finding some moisturizers, you should probably step up from using gel or more lotion liquidy like moisturizers, just something that’s a little thicker and creamier, remember that just because something is super thick and super creamy does not mean that it’s gonna be the best for your skin, because there are still differences between moisturizers, so look more so into active ingredients that will deliver hydration and nourishment for your skin, because even though we all have different skin types, things like dryness dullness and like flaky dehydrated skin is actually a skin condition, and it comes from not moisturizing enough, hydrating ingredients include ceramide which is the glue that holds your skin cells together, and helps your skin cells hold on to moisture, glycerin which is a humectant which helps in absorbing water from the air, and retaining it in the skin to keep it supple and moisturized, as well as hyaluronic acid which is also a humectant, if you guys have been watching our skincare series, you know how many times like we always say that hyaluronic acid can hold up to a thousand times its weight in water, because our bodies actually produce hyaluronic acid naturally, it doesn’t just retain moisture, it actually draws moisture from the air, so the first moisturizer that I’ve been using recently maybe for the last couple of months, has been from Skin Iceland, I’ve only learned about this brand very recently, but what I used first was this spray moisturizer, and at first I thought spray moisturizer, it’s like a gimmick whatever, it’s like why do I want moisturizer all up in my hair and everything, but it’s actually very velvety and moisturizing, can you layer it, yeah so like sometimes I’ll spray one layer and then pat it in or rub it in, and then I’ll just like go again, because the mist makes it a little bit more fine, and so just depending on how much you need, you just keep putting it on until it feels nice and hydrated, and I feel like especially at night , I always moisturize at least double than what I do in the morning, because I just find that in the morning if I don’t moisturize more, it’s just very dry, so I’ve been using this Ultimate Nourishing Rice Overnight Mask Spa mask from Cosrx, and this is amazing, it’s a sleeping mask but I think the older formulation is a little creamier and thicker, it goes on very smoothly, and it kind of blends water, It’s super hydrating, it lightens because I think it’s made of 65% rice extract, sixty eight point nine, sixty eight point nine percent rice which helps brighten your skin, I use this as the last step of my routine after moisturizing. I read online I just went through a bunch of reviews, you could just use this as a moisturizer on its own in the daytime and at night, normally when I was sleeping mask, I wear it after serum, because it’s already like locking it in, so you can use overnight sleeping mask, like whenever you feel dehydrated, you can use that as your moisturizing step at night, save me, honorable mentions include the The Body Shop Drops of Youth Youth Cream, as well as the IT Cosmetics Confidence in a Cream Moisturizing Super Cream and the Clinique Moisture Surge Intense Skin Fortifying Hydrator, eye cream is next and should not be forgotten, because our precious little sensitive eye area has actually the thinnest skin on our body, it’s almost a quarter of the thickness compared to anywhere else on our body, and so we gotta take care of it, because it also doesn’t have oil glands, and so we can’t replenish and moisturize it, It’s like the thing that dries the quickest in the wintertime, yeah and that’s why we get wrinkles fine lines and things like that first under the eye, okay we’re gonna do a whole video on eye creams very soon, and the thing with that is you can actually just use a moisturizer and mix it or dilute it with a very plain moisturizer that doesn’t have active ingredients, and it becomes an eye cream, because if you look at it, the active ingredients are essentially the same as a moisturizer, it’s just diluted and you’re paying a little bit extra for it, but that’s not to say you shouldn’t moisturize your eye with an eye cream, it’s just like if you find one that helps then use it, if not don’t lose your hair of finding one specifically, for an affordable option, going back to Mario Badescu, this is the hyaluronic eye cream, and it’s like a no-fuss moisturizing eye cream that is not too thick where it can cause you like milia, which is where it kind of clogs the pores around your eye, and it turns into these white things that are not whiteheads that you actually need to get a needle to poke or go to the dermatologist for them, yeah I put it under the eyes, and it’s not good for dark circles or puffiness or anything like that, it’s mainly for nourishing, but one tip is that you can actually apply your eye cream, put it onto like a spoon, and then use the spoon to slowly glide over your eye, and that’s like the metal buds that you’re paying for, so it’s like DIY version, but when it comes to eye creams just make sure you at least moisturize it with something that’s not too heavy, and then I’ll start off under here, and then anything left I’ll just like spread it all over the eye, and it’s best to use this finger, yeah your ring finger because it’s the weakest, it’s like the perfect pressure, yeah so for wintertime eye cream, as long as it’s hydrating, as long as it’s moisturizing, as with every other step of the routine, oh you’re golden, it was 18 and it’s nine and you can get it on January 14th, but another thing that I want to mention is the Dr Brandt no baggage eye cream, that was actually like crazy for me when I first used it, because it’s this weird orange color, and it’s kind of got this silicon texture, and I thought it was like gonna be really thick, but it instantly makes you feel awake, I’m alive. It’s like rubbing Burt’s Bees or on your eyes, don’t do that. But also if you’re looking for other ones as the Clinique All About Eyes and the First Aid Beauty 5 in 1 Eye Cream Age Delay. Next is facial oils, remember facial oils don’t hydrate and moisturize like a moisturizer would, so they’re two very very different things, moisturizers just seep deep into your skin while oil just kind of sit on top, and then keep your skin nice and protected and smooth and glowy, because it is an emollient, so it does have that skin softening property, if you’re finding that your normal moisturizer isn’t doing the trick, you can look for a facial oil, because facial oils can replenish dehydrated skin, because it’s able to deliver vital fatty acids and seal in moisture, if you’ll still dry after moisturizing, and if you need that extra hydration, you can also mix your facial oils one to two drops in with your typical moisturizer, and then apply it like that, so what I’ve been using is the Dermalogica Phyto Replenish Oil, it’s really cool because it works in three steps to strengthen hydrate and shield your skin from outside elements, so the Camilla and tamaño oil helps restore the skin’s natural barrier, so this is ideal for daily use for anyone who has normal to dry skin, if I feel like my skin is very parched, and it’s in desperate need of some TLC, and I’ll put it on or just almost every other day and then the days in between, I’ll use something like either a sheet mask or face mask, or something like the overnight sleeping mask from Cosrx, so same for me, in the winter months, I’ve been using two actually, I mean they probably do the same thing, both of the ones that I use are rose hip, the first one is the Julep Boost Your Radiance Reparative Facial Oil, so I really love this oil because if you look at the ingredients, rose hip oil is the first and then it’s shea butter bergamot fruit oil, and then lastly vitamin E, vitamin E actually helps with the absorption of rosehip seed oil, and it also protects your skin from things like free radicals and antioxidants, and rosehip oil is great for all skin types, even acne prone oily skin but especially dry skin, because it helps to reduce fine lines caused by dryness, and then the bergamot oil helps with brightening the skin and is a natural antiseptic, let’s do a smell test since they’re both rosehip oil, I just just smell your breath, that’s good, smells like citrusy, smells very citrusy, oh maybe that’s the bergamot, this smells like dirt, oh no it smells like fresh-cut grass, not dirt it smells like fresh cut grass, so this one is really yellow, but the thing is I think because this has vitamin E as well as bergamot oil, so it’s not pure, but this one is like pure. I put two to three drops of this on, spread it all over the face and the neck, make sure and you’re good to go, also just remember anyone can use facial oils, it’s not just dry skinned peeps, especially for the winter time, so the Julep is normally $36 but you can get it for $18 on January 19th. So if it were nighttime facial oil would have been your last step, but if it’s the daytime sunscreen even in the winter, yeah even especially in the winter, because while you may be indoors for the whole day, while the Sun might not be out that doesn’t mean the UVA and the UVB rays aren’t raging full force outside, because they penetrate through the clouds and all of that stuff, you just don’t see it as bright and shining as in sunlight, but their rays are still there, so it’s very very important especially if you use exfoliating chemicals in your products in your skincare routine, AHA BHAs and because your skin is so sensitive, if you use it at night, chemical exfoliator during the next day, be sure to hit that sunscreen, so the Shiseido Urban Environment Oil-Free UV Protector, when I first moved to New York the first year the first winter, this was all I used, so I think it’s made for the city, I like it’s anti pollutant, probably a marketing, and I love this because this it glides on, it’s so watery, so watery, and it just kind of like melts into your skin, That’s so thin. so compared to the Korean sunscreens that I’ve been loving, I feel like Korean formulations are more they’re a little thicker, but then they also blend very nicely, it really depends on what you want, this one has a lighter, this one’s definitely very fluid consistency, 72 SPF and you have the moral of the story, very important to hydrate moisturize and apply sunscreen, you don’t even notice your skin is dry until you put makeup on, and you’re like what is this flaky business. So actually a tip is to before you go to bed, have a cup of water, or drink one before you go to bed, and then just have it there, there’s a lot of lifestyle tips too, don’t shower with water that’s too hot, make sure the temperature in your home or your apartment is toned down to the lowest you’re able to for you to be like relatively comfortable, because if it’s too hot, it is gonna be very drying, and just definitely hydrate from the inside and out, yeah and like one of the ones that we both highly recommend is you get a humidifier, because that restores moisture in the air, and things like hyaluronic acid and things will absorb it into your skin, so if you guys haven’t already written down the days for these deals, we’ll get everything down below. It’s all below and it’s from Jan 6 to 26, so yeah pick up some skincare deals, because 50% will be no longer, so if you have any other questions about skincare routines, or building up a skincare regimen, make sure you leave that below, if you have any questions about that, and we will see you the next week’s video bye. .